Yesterday I attended a workshop on writing short stories that get published with a young writer named Nuala O'Connor (Ni Chonchuir), who has several collections of short stories, poetry and novels to her credit. She has a very gentle manner. She teaches creative writing on occasion, and in this case, Mayo County Council's art council hired her to do a workshop at the Linenhall in Castlebar. Attendance was free and Alex and I were quick to join up. Although the format of the workshop would not have been my choice, I did learn some very useful tips. Armed with lists of to dos and not to dos, I am about to tackle my list of short stories again. I have a collection under the working title "Joy of Sailing", which I have to edit and find a new title. I have several beginnings of sci fi short stories that I need to expand. I have already edited Alex's short story, The Invitation, with a completely different eye than last time. 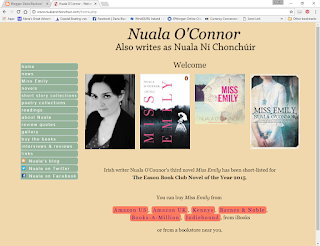 Thank you Nuala and MayoCoCo, for the inspiration to get back to work in new directions.